We're back again with the next installment of the Room-by-Room House Tour. 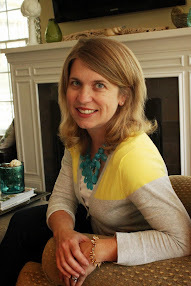 I'm still swooning over your gorgeous kitchens, but it's time to move on to living rooms and libraries. Of course you can still link up your kitchens until midnight tonight. Here's the full weekly schedule for those interested in what's coming up next. 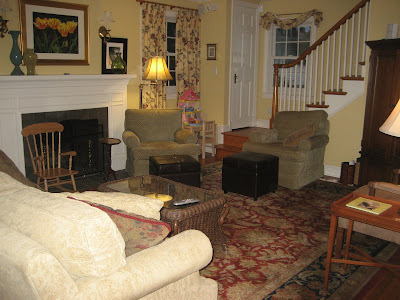 Here's a quick tour of my living room which is open to both our family room (and addition) and dining room. Here's a picture of the new pillows I whipped up a few weeks ago. I love them and it makes me want to bring more blue back into our house. 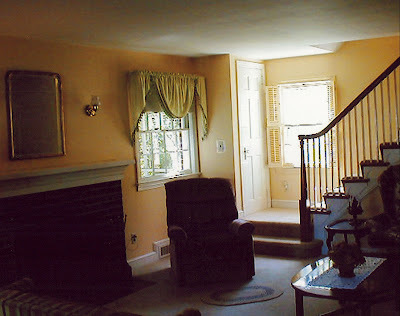 For reference the door on the right was the window with the yellow floral drapes, and the stairs went up the back of the house, which is now open to the new family room. Sources: Chairs - Rowe Caldwell; Coffee Table - Pottery Barn; Blue Pillows - DIY; Monogrammed Pillows - A Needle Pulling Thread; Rug - Greenfront Furniture; Console Table - Crate & Barrel. Your turn!! Link up your living room, library, or other formal room in your house. Please add my button or link to this post in your post. Like this post? Vote for us by clicking here (and that's it!) - THANK YOU!